For the hundreds of incarcerated men, women and children serving prison time in the 1700s, life was a hellish experience. But in the summer of 1779, one of the world’s best known prison reformers took a trip to Wymondham for a prison visit which would lead to an international revolution. The Bridewell tea room at Wymondham Heritage Museum was packed for a performance of music from the 1920s to the 1940s. A historic piano used in a Norfolk town’s earliest cinema has been donated to a heritage museum. The role of “our boys” in the First World War is often much celebrated. But now a popular town museum is set to reopen for its 2018 season with a new exhibition marking the equally important role women played in the conflict. On Thursday, January 25 from 7.30pm Wymondham Heritage Society will launch its new season with a social evening at the Fairland Hall. Women once laboured there for hours on end, washing and drying clothes in conditions that can truly be called ‘Victorian’. Researchers have appealed for help to build a picture of the role women played in the First World War for an upcoming exhibition. The newest addition to Wymondham Heritage Museum traces the story of the market town alongside major events in British history. Standing at an easel to paint is straightforward, but when your canvass is a large wall, where do you start? To find out, Neil Haverson meets a local artist. The team behind the Wymondham Heritage Museum has put out a call for volunteers to help out in the museum’s tearoom. I recently paid a visit to view the new displays for 2017 at the Wymondham Heritage Museum called ‘The Lost Pubs of Wymondham’. Wymondham Heritage Museum will hold its official opening for its new season on Monday, March 27. It is a building steeped in a Norfolk town’s deepest and darkest history. Could you imagine if a town like Wymondham had 33 pubs? It may seem far-fetched for a Norfolk market town to have so many watering holes, but Wymondham actually had that many back in 1622. A call has been made for more people to volunteer at one of the area’s biggest drawcards - the Wymondham Heritage Museum. When he was just a teenager, a schoolmaster told Eric Thorburn he would almost certainly flunk his history exam. For many, wonders of the world might conjure up images of Egypt’s colossal pyramids, or the romantic tale behind India’s striking Taj Mahal. A collection of maps showing Wymondham in the 1800s has been published into a book by the town’s heritage society. A former head of the British Army has helped Wymondham commemorate its local connections to the First World War. Planning for 2014, the Wymondham Heritage Group at Wymondham Heritage Museum. 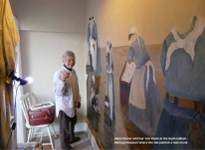 Pip Woodward with part of a new 1st world war exhibition being installed. War heroes from Wymondham will be at the heart of a new exhibit in the town’s museum this year. A stream of flags or banners will be created in Wymondham to tell the story of Kett’s Rebellion in 1549. Wymondham Heritage Museum is set to host a special exhibition of photographs and memorabilia to mark the 70th anniversary of the ‘Friendly invasion’ in Norfolk. A decision to close a Norfolk museum could be made as soon as July or August following a poor response from the public to an appeal to save the heritage facility. A Norfolk museum’s committee is warning that the facility, which boasts artefacts dating back to Kett’s Rebellion in the 16th century, could have to close unless it can attract more visitors to boost income. Wymondham Heritage Museum has reopened following the winter break with a host of new exhibitions. The story of Wymondham College, which celebrates its 60th anniversary this year, is commemorated with a new exhibition at Wymondham Heritage Museum.